As soon as Netflix released the third season of House of Cards, my social life ended in change of watching television while having dinner, staying up late, and eating junk food. I am the definition of “couch potato” these days. 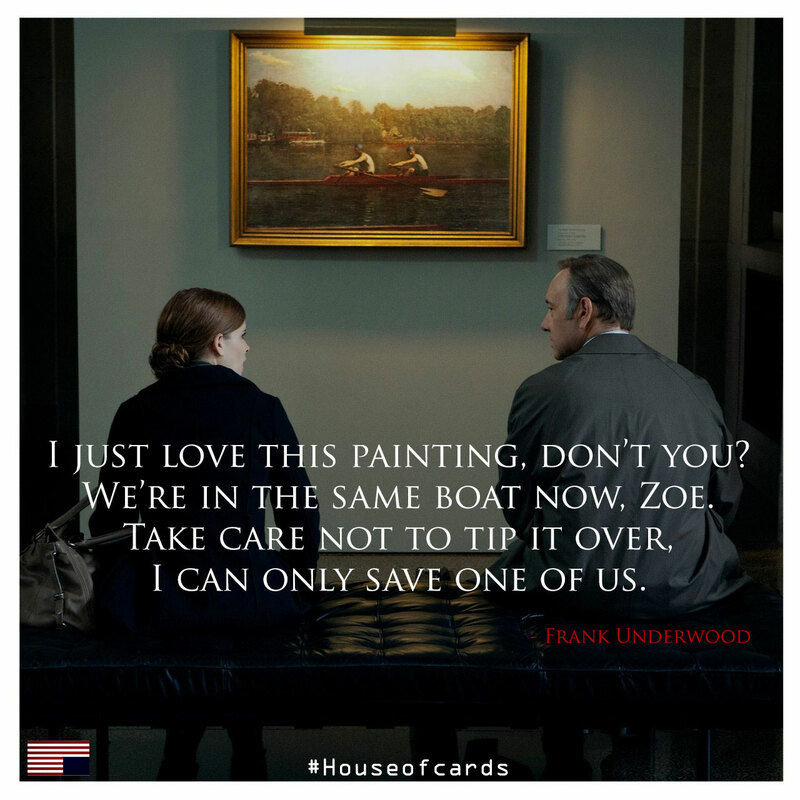 For those of you who don’t know, House of Cards is an American TV-series starring Kevin Spacey and Robin Wright as Frank and Claire Underwood, two spouses craving for power in Washington, DC. Their attitude is cynical and unscrupulous. As a consequence, their words are often telling examples of political pragmatism. The fine print, or small print, is a legal or commercial expression which indicates the words printed in little types at the end of a selling contract or an advertising offer. Often they add details which make the offer less favorable than it appears. 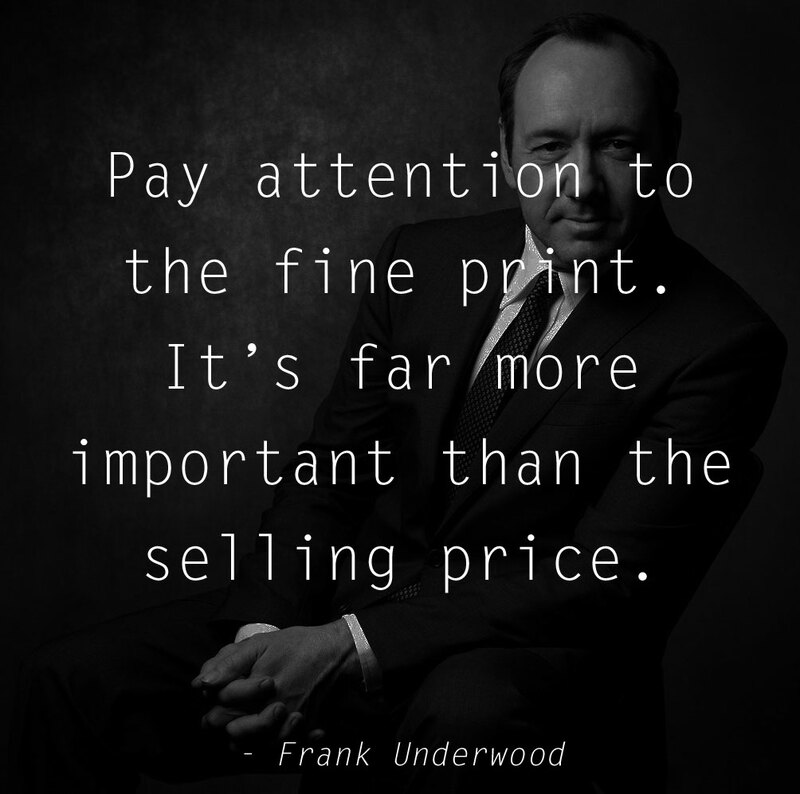 Therefore, the sense of this quote could be paraphrased as “Be aware of the details. They are more important than the big picture”. To be in the same boat is the idiom that indicates “to be in an unpleasant situation as well as other people are”. The implication is, if the boat sinks, every passenger would be in trouble. And to tip over means to overturn, upset, or incline. In this occasion, Frank is referring to the proverb Do not look a gift horse in the mouth. 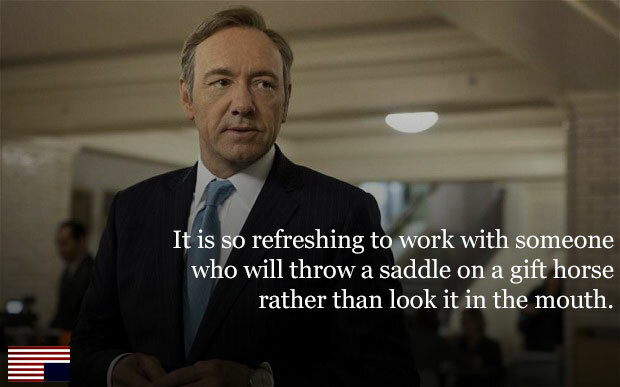 A smart person, like Frank, would doubt everything gifted, and surely will check the horse’s teeth out. Instead, an ingenuous person would throw a saddle on the horse, being instantaneously ready to ride it. Welcome to my blog! Hope you find here the best resources for your English. Start exploring the categories, scroll the posts, or reading my bio!